This is a delightful par 3 with the competition tee to the right of the hole offering a tough challenge bordering the boundary road to the beach. Many a stray ball has ended up in or over the road from the tee as players grapple with the right to left crosswind but the hole fascinates with water running the length of the hole on the right and out of bounds left. There are two bunkers on guard front left and one front right to catch the shorter tee shot and the green has a severe slope falling away from the back to the front. 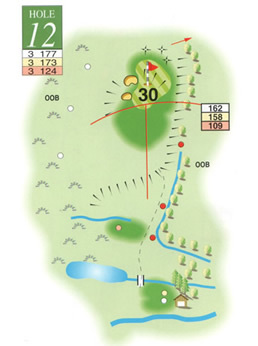 Pin placement can make putting difficult if the hole is at the back of the green as a long uphill stroke needs to be well-judged to secure birdie.